Detail from a Book of Reference. 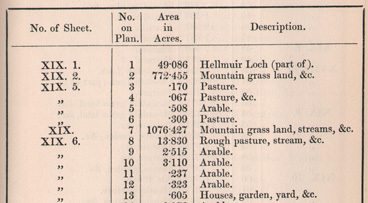 The Ordnance Survey Books of Reference (or Area Books) record acreages of each land parcel on the OS 25 inch to the mile maps, and usually its land use, except in settlements and for counties surveyed after 1879. Not all counties had Books of Reference published for them. Counties surveyed at the six inch to the mile scale before 1855, do not have 1st edition 25 inch to the mile maps nor Books of Reference. This is the case for the counties of Edinburgh, Fife, Haddington, Kinross, Kirkcudbright, Wigtown, and the Isle of Lewis. From 1855-1859, the Books of Reference were usually published as A0-sized lithographed sheets, which could be cut and bound into booklets. These sheets cover parishes in the following counties: Ayr, Berwick, Dumfries, Forfar (selected parishes), Lanark (selected parishes), Linlithgow, Peebles (selected parishes), Renfrew (selected parishes), Roxburgh (selected parishes). From 1859, Books of Reference were published in booklet form for specific parishes, which the Library rebound together into 22 volumes, ordered by parish into alphabetical chunks. These can be viewed in our Digital Gallery, ordered alphabetically by parish name. The listing below by county and parish, links either to the lithographed sheet, or to the specific parish Book of Reference title page within the digitised volumes.